Those are just a few of the milestones veteran Roughnecks forward Dane Dobbie has surpassed this season. But perhaps most impressive is that the 32-year-old also leads the NLL in points, having the best offensive campaign of his 12-year career, sitting at 99 with two games remaining in the regular season. What’s the secret key to his success? Well, there isn’t one really. It’s just Dane Dobbie being Dane Dobbie. “I don’t think it’s anything different he’s doing,” said head coach Curt Malawsky. “He’s just going about his business and doing what he does. “This season, he’s had the ball in his stick more than he has in the past and we’ve kind of asked him to step up a little bit more in a floor general role where early in his career he was more of an off-ball guy. Some folks may find it unusual for Dobbie to be playing at such a high level at this point in his career. Malawsky’s not one of them. He said that experience is exactly why he’s peaking right now. “The older, the wiser,” Malawsky said. “There are young guys coming into the league now that don’t really know a lot of his tendencies. He mixes things up, he’s not the same old thing every night. He scores in all different types of ways; he gets inside, he scores from the outside, he scores on the backhand – he’s very unpredictable. Dobbie can thank well over a decade of reps for those tools – and a few other people, too. 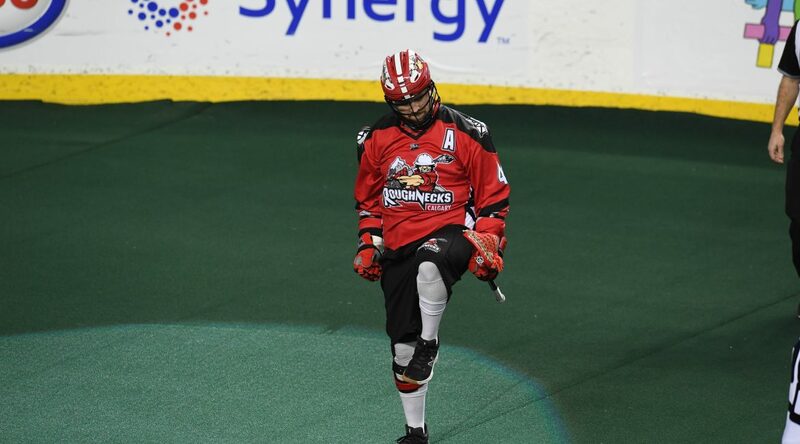 Kicking off his career in 2008, Dobbie had the opportunity to play with a Roughnecks team that boasted offensive standouts such as Josh Sanderson, Tracey Kelusky, Kaleb Toth, Scott Ranger and Malawsky. “I was able play with him as a rookie in the NLL when I was still playing,” Malawsky explained. “He had so much compete, fire and willingness to learn from the older guys – he’s that old school guy that spent a lot of time early in his career listening to some really good veteran guys and taking it all in. Plus, there’s one other big intangible that makes him the player he is. “Once he decides to hang them up as a player he’s going to be an outstanding lacrosse coach,” Malawsky said. “He screams character and intelligence. “He’s a definite Hall-of-Famer. And I’ve said it many times before; his jersey is going up in the rafters in the ‘Dome, and he’ll be joining some elite company up there.